Hi everyone I'm on the MarkerPop Blog today and I have a fun card using the newest Friends for All Seasons:Fall Set from WPlus9. I started out with a piece of Watercolor Paper and I die cut the Tree Border Die from WPlus9 about 3/4 of the way down the panel. Then I used some Twisted Citron, Mowed Lawn, Tumbled Glass, Salty Ocean and Squeezed Lemonade to add color to the two pieces. I adhered the two pieces back together and adhered it to a Top Folding card base. Then I die cut a Frame from the Lawn Fawn Stitched Rectangle Frames from some Wood Grain paper. I adhered the Frame over the card front with some Liquid Glue. 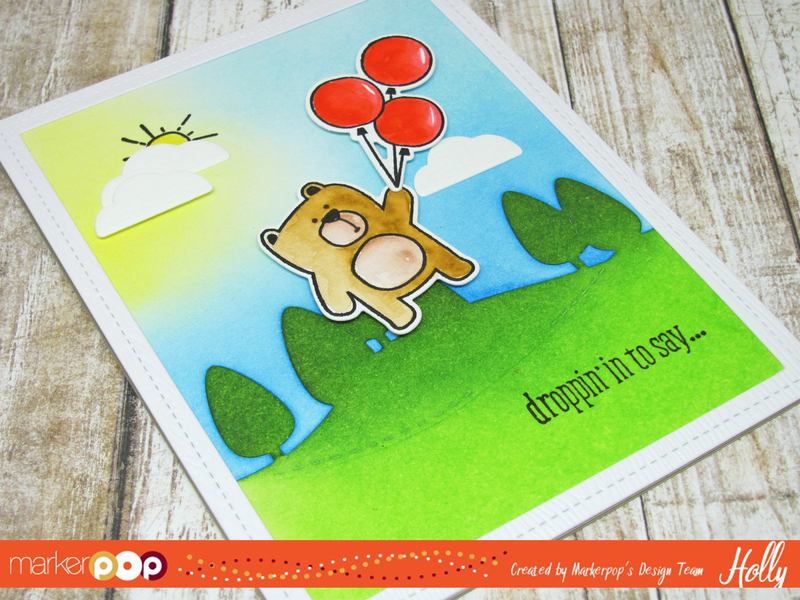 Then I stamped the bear and Balloon images from the Friends for All Seasons: Fall set from WPlus9 onto some Watercolor paper and colored them in with Zig Clear Color Real Brush Markers. 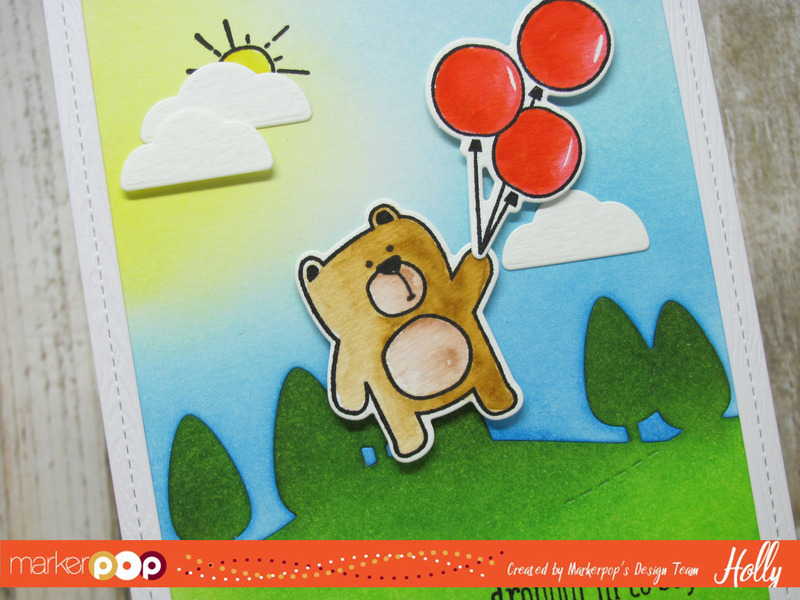 I used Beige & Blush for the Bear and Red for the Balloons. Once they were dry I die cut them with the coordinating dies. I stamped the sun image from the same set directly onto the card front with some VersaFine Black Onyx ink. I added some Yellow to the Sun with the Yellow Zig Pen. I like to add color to just the inside edges of my images with the Zig Markers and then using a slightly damp paintbrush I move the color around filling the image in. Once it's dry I go back and add a little more color with the marker and just let it dry. I die cut two clouds from the WPlus9 Happy Birds Die set using the same Watercolor paper and adhered them directly onto the panel. I stamped the sentiment from the WPlus9 Friends for All Seasons: Spring set in Black ink as well. 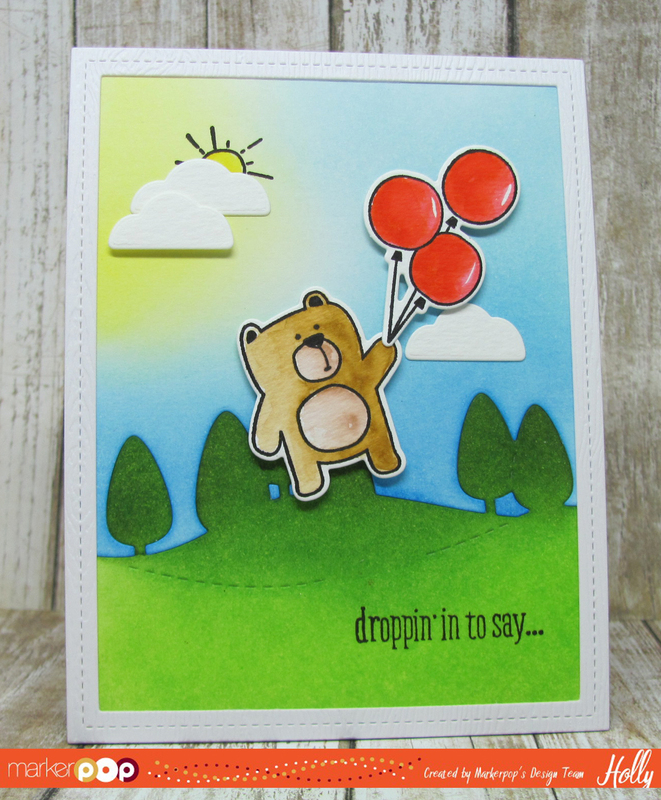 I attached the Bear and Balloons with some Foam Tape and this completed my card. I really like how the Friends for All Seasons sets coordinate with each other. You can find all of these sets in the store.